Get ready for a seminar like no other! 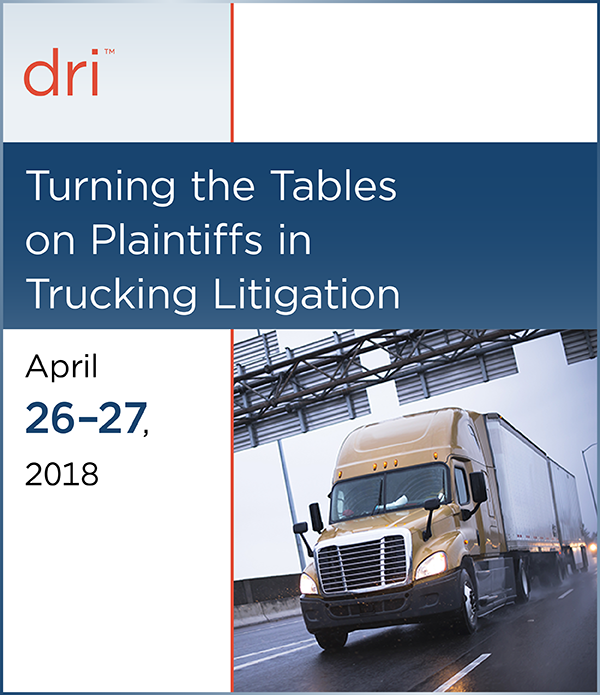 This DRI trucking conference kicks off with a seasoned trucking plaintiffs' lawyer's candid perspective and a fantastic "counterpoint" response by a trucking defense counsel, along with a series of presentations focused on turning the tables on trucking plaintiffs. This entire seminar is focused on helping all trucking practitioners, practically and methodically, to defend and to mitigate trucking loss risk. Please note the DRI Hotel Block is sold out and attached is a list of hotels near the Hilton Chicago. You may periodically check back with the Hilton Chicago, as hotel rooms may become available within the DRI Hotel Block.